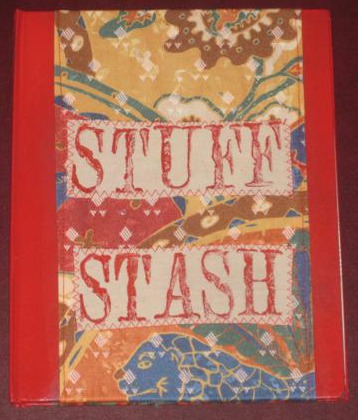 My Stuff Stash Book has a textile cover with textile collage applique. The eight pages are made from envelopes which are left open at the top for the storage of recipes. The pages are embellished with prints for interest. The pages are left clear for the addition of notes. 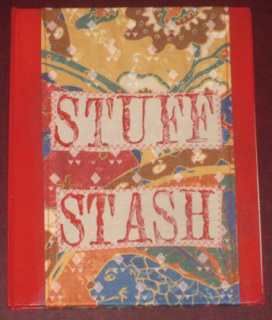 ​When you purchase a Stuff Stash Book it will have been made from the materials available at the time, not necessarily those displayed here. If colour is critical contact me before placing your order. 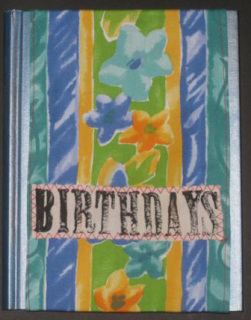 Birthday book with textile covered hard boards. 74 pages made from envelopes with month page tags. ​When you purchase a Birthday Book it will have been made from the materials available at the time, not necessarily those displayed here. If colour is critical contact me before placing your order. ​This address book is approx. 6" x 5" and has textile collage on a hard cover. The 112 pages are made from copier paper and have page tags to indicate the letters of the alphabet. Pictures of the inside of these books may be seen in my blog of 12 September 2016. ​When you purchase an Address Book it will have been made from the materials available at the time, not necessarily those displayed here. If colour is critical contact me before placing your order. 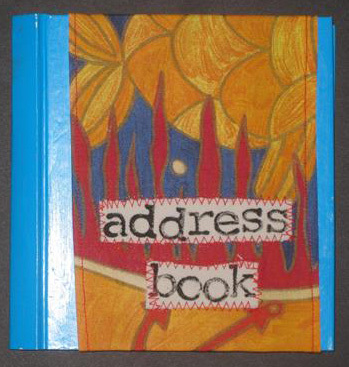 Further pictures of the Address Book can be seen here. 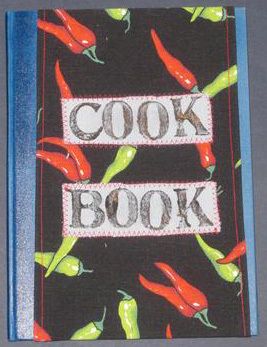 My Cook Book has a textile cover and the end pages front and back have textile collage appliqued. The eight pages are made from envelopes which are left open at the top for the storage of recipes. The pages are embellished with cookery themed prints for interest. The pages are left clear for the addition of notes. ​When you purchase a Cook Book it will have been made from the materials available at the time, not necessarily those displayed here. If colour is critical contact me before placing your order.